Welcome Back to Monday Motivation! Always good to have you here! This week I have the pleasure to share something fun and beautiful with you complete with an Aurifil Giveaway! This week is the the first brand new Block of the Month hosted by the very lovely Jacquelynne Steves called Maggie's First Dance. You can find Block One by here. The blocks will be issued once a month and will contain a variety of techniques for you to create your block. This BOM is for just six months so it will be fast! You can have a new quilt ready for the holiday season! For the first block, I tried something way out of my comfort zone. Free motion embroidery! The block is perfect! I wanted to try something new for center block. The free motion embroidery was interesting way to create the center block using many colors of Aurifil thread in both 40 and 50wt. To make this easy center block, I printed the embroidery portion of the pattern. I cut a square of fabric about the same size as the page it was printed on 8.5x11in. I used Pellon sf101 fusible interfacing and ironed on according to the manufacturer's instructions. When the fabric cooled, I used painters tape ( or you can use wash tape) to place on a window or if you have a light box that would be great too! Frixion pens are wonderful for embroidery pattern tracing. They have a thin tip and iron away if you make a mistake or when you are finished and do not want lines to show. After the pattern has been traced, it is time for fun! I have a Bernina 440qe. 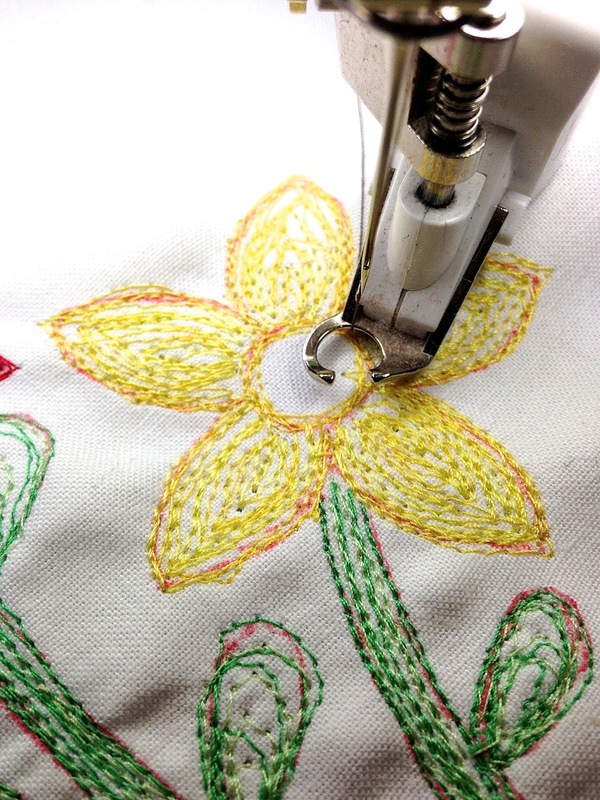 I am using the help of my BSR to make the free motion embroidery process easier. Get your machine set for free motion quilting and start by following the lines in each section. I started with the stems, since they are straighter and easier to fill. I used two colors to give some depth. Then I started on the petals of each flower. I started slow by outlining each petal and center then starting filling in. Then fill in the centers with a different color. The only downside is that I have some puckering around the petals of the flowers. I may need a hoop for making the fabric more taut in the future or maybe try a thicker stabilizer. I may try both and let you know how it goes! Here is a photo of the full quilt we will be making together! Isn't it lovely! 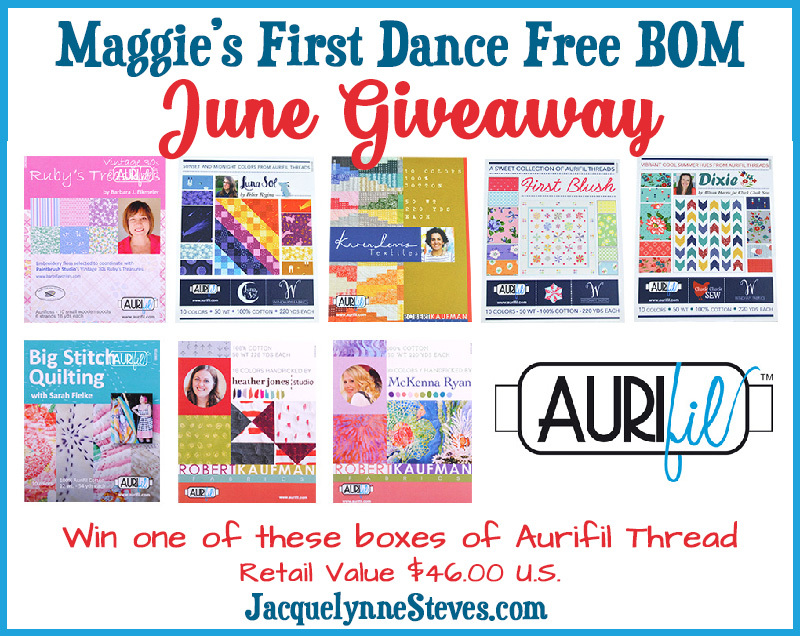 Now for the fabulous giveaway sponsored by Aurifil Thread! 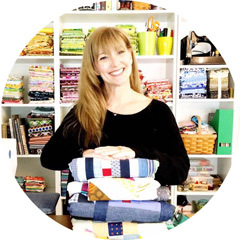 To get this party started, Jacquelynne will be giving away a small spool Aurifil collection! This giveaway will close June 12 and a random winner will be chosen and announced by June 14, 2016. Have you started making your holiday projects? If so, how many have you completed? How is that for Motivation!?! Oh, my! I can't even begin to think about holiday projects yet...but I probably should get started on them! I haven't started yet, but feeling motivated! I haven't started yet, beyond collecting some fabric for them. Very pretty! I can't wait to get started! This quilt will be the start to my holiday sewing - I bought really cute snowmen to use for it. I love your flowers, I need to buy a free motion foot and try it. Great job with the FM embroidery! I can't believe you're a newbie! I haven't started holiday sewing....gotta get teacher gifts done first, right? pretty fall colors and nice free motion embroidery, have never thought of trying that. I'm just starting hand embroidery. Yes I have started my Christmas Projects, I purchased the fabric last year, collected patterns and purchased a couple of kits at 70% of at Connecting Threads a couple of weeks ago. I starting my first stocking wine tote today. Well, I have four stockings to do. Have the backing & lining. Also, the fronts (cross stitch) are done. Just have to add the seed beads & put them together! I have done 2 stocking already out of 5! Before I answer your question about starting holiday projects, just thought to offer a bit of advice on your thread painting (free motion) and that is you should use a stabilizer on the back and stitch around the outside edges of the block before you start thread painting. The stabilizer and stitching will help to prevent distortion when sewing the block, i.e., pulling in the sides and or puckering. Once you have done your stitching, turn it right side down and press with a pressing cloth. Helps a lot. Now on the question of holiday projects, I usually start creating gifts the end of January. This allows me time to decide on a project and get it done without having to rush and if it is to be mailed, that can be done timely as well. Hate the last minute rushing and panic. Thanks for the opportunity to win one of the many wonderful Aurifil threads. Free motion embroidery is a great idea for this BOM! I have tried a bit of thread-painting, it takes so much longer than I anticipated, but I love the results! Christmas projects are always on my mind, but I have not yet started on them! NO - I haven't started my holiday projects yet!! I don't think about those until much later in the year!! I haven't started my Christmas projects but have patterns and ideas ready. I have not started my projects yet, but I have pinned a lot of neat ideas on Pinterest! This year I'm doing dish towels and Christmas stocking for the most part, and have 3 dish towels done so far, and one of two Christmas quilts. I've barely thought about holiday gifts. Life is so busy! Love your flowers. Love the way you free motioned the center! I have not started any holiday projects yet, I better get on the stick. I love your take on the block of month. Thanks for sharing. Holiday projects? Fourth of July---yes! Christmas--that would be "no." Every quilting day is a holiday! Have my eye on a few projects for the holidays, but I've been enjoying working on many spring/summer projects. Love your free motion embroidery! I generally make PJs for all my grandkids for Christmas. I have the fabric but that's all. I probably wont' start until Thanksgiving. Love the machine embroidery flowers. So fun. I have not started any Christmas projects yet, but I am looking for ideas. 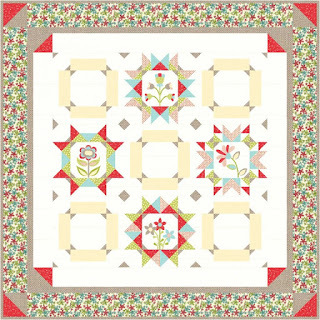 No holiday projects yet but I do have a Christmas quilt pattern that I want to make. I am making a brown and white Bear Paw Quilt now and maybe when this one is done, I will start on the Christmas Quilt. Thank you for being a part of this Aurifil Thread giveaway and giving us all a chance to become a winner. Just gotta love Aurifil. No holiday projects for me yet...maybe a quilt fir my grandson a bit later. Haven't started yet as finishing a quilt for 1st B-Day gift. Have a large stack of towels to make towel hair wrap/turban for my friends Christmas gifts! I'm too busy planting flowers finally in Lancaster County, PA! I have started on my Christmas gifts! I plan on giving some of the QAL and CAL I complete as gifts! It's a great way to learn new things and have gifts ready at the end of the year! Noooooooo not yet. Enjoying the warm weather!! "Good Grief" if I may take a quote from Charley Brown, I have so many other projects to do after moving into our newly renovated home that holiday, I assume you mean Christmas, projects will have to wait. I am doing Memorial Day/July 4/Veteran's Day R/W/B projects now. It's great, you can do one project for three holidays! Um, no. I've not started making my holiday projects, though I've started planning what I want to make. Mainly some cute christmassy dresdens! Thank you for the giveaway!!! No holiday projects yet! Soon, though! I have made some candlemats and a tabletopper. So just 4! But i am very happy about this,lol! Yes, my mother and I have started making these cute hot pads to give away for Christmas, so every time we get together, we make a couple sets of hot pads. I think so far we have made about 4 sets. No I have not started Christmas presents. I always over-commit, and am always burning the midnight oil. I have birthday presents just about every month, it seems. Our holidays start later here in the UK. Maggies First Dance is my holiday project this year. Haha! No way am I already working on Christmas! I wish! (Grin) I love my Aurifil thread, too, and your free motion embroidery is awesome! I've made one candlemat to donate to my church sewing group for their sale. I haven't started yet, but I am working on some projects that are due in the Fall. I love your free motion embroidery. Which holiday? I've pieced a small table runner for the 4th of July and just need to quilt it. The grid stitching seems best for this project. Otherwise, Christmas is too far away to be motivated yet. Thanks for the post about your free motion design. I have made a Halloween table runner but that's it. No Christmas projects yet. I haven't started my holiday projects yet, but I do have fabric and patterns for 3 of them. I have ideas to add small gifts - potholders, mug rugs, etc. I haven't even thought about Christmas projects yet. Wait until it gets hotter and I've go the ac turned up really high. Then, I'll be in the mood to do "Christmas". I make gifts all year long and many of them will end up as Christmas gifts. I probably have 6 or 8 done that I will give at the holidays -- if I don't use them for birthdays or anything before then. Free motion embroidery is a great idea! It looks really cool. Your embroidery looks like a water color painting. Love it. Holidays oh no not yet. Just getting used to the sunshine. Oh, how I wish I had gotten started on my holiday gifts!! I haven't even decided what I'm making, yet!!! Holiday projects? Oh dear...not there yet. I'm so, SEW excited to be the owner of a brand new machine. We're in the "getting to know you" phase...so new threads would be a fun win for sure. Hi. I just bought some cute Christmas fabrics from my local quilt shop and I'm going to make some pot holders for my nieces who like to bake cookies at Christmastime. I might even make them aprons but I haven't decided yet. I'll give them the pot holders during our Thanksgiving gathering. I have not started any Holiday items yet but i have purchases and set aside some fabric. Haven't started any holiday projects yet. Does thinking about it count? But to be honest, I haven't really even thought about it much. No, I haven't :( I do know what I'm going to do for most people. I just need to get started. Your free motion embroidery looks beautiful! No, I haven't started Christmas quilting yet. I was just looking through my UFO's the other day & found a Christmas table runner. I finished it the other day. 1 down how many more to go??? Love, love, love the FMQ center! Brave and talented girl. I have not started on my Xmas quilting. Looking for a particular fabric the other day I pulled out my Christmas bin. Glad I did because there were some fabrics in it that weren't Christmas related. I looked at the Christmas fabrics I had in there and thought I really need to get started on some of this stuff. So it's in the back of my mind just not motivated enough yet I guess. Thanks for sharing how you used FMQ to fill in the applique. I will be interested to hear about impact of other stabilization options. It certainly is a big learning curve, but lots of fun. I love this first block of the BOM! Love your Free Motion Embroidery! I have tried it too! It is fun! I have been thinking about Christmas Gifts but haven't started them yet! Thank you for the chance to win! I have started my Christmas time Makings! I am doing some crochet of course but also working on the quilts. I have my son's quilt top completed and need to work on the quilting and binding! Lots more in progress! So much Fun, so little time! I have barely thought about Christmas except that I may make my mother in law a new apron and some matching kitchen accessories. Haven't really found a pattern I like yet. I have not started any holiday projects as of yet. Do not know if there will be any either. I tend to make stuff that can be used year round. Good grief I can't even think about Christmas yet. The guild season just ended this morning but next year's budget remains to be done and the pool just opened up. Whatever has to survive sitting by the pool. I have made a couple of holiday projects. Ummmmmm, no to the holiday projects! I have a long, long, long list of things I can make in my head though! Does that count? Thanks for the giveaway op! I have not started Christmas sewing yet -- but I will start next week! Hmmmm... Does thinking about what to sew for the holidays count? If so, yep... I've started LOL!I actually have an Advent calendar for my grandkids that I didn't get finished last year so it's on my calendar to pull it out in October and finish it. You know how those best laid plans go though! Haven't started a single one but have many projects ready to go. No I haven't started any holiday projects yet. I have started on some Halloween projects. I had some for several years and finally decided I would like to have them finished for this year. No, but I guess I better start at least planning. Time is passing too quickly. Hard to believe the year is almost half over!!! Holiday projects? They aren't even on the radar yet! I have barely thought about Christmas! I'm a teacher, so I have just been looking forward to summer break! I haven't even started thinking about Christmas projects yet, although I might have a few ideas. I haven't started yet, but I know what I will do during summer, only make a start now. I've been working away on Christmas in July prseents - so far ten little pixie baskets, and 9 mug rugs!!! Thanks for sharing your machien embroidery ideas!! No holiday projects yet because our summer break starts at end of july ... still a few eekes to go. New to quilting...signed up for several holiday projects offered by our local quilt shop's Chritmas in July. I should have started my holiday presents but I've only managed to complete birthday presents and a baby shower quilt. Thanks, great blog. Love the free motion thread painting. Holiday sewing, not really. It has been 115 degrees here and Winter seems a long way off. I have started my Christmas items and they are taking far longer then I thought. I am so far behind now, I may never catch up. I love the pillow you have displayed on your blob. I want to make one like it. So I will be checking out your tutorial. Your block is super! What a great idea to do free motion embroidery. Holiday gifts? Ahh no, not yet done. I thought I had another month, July was the month to start making gifts, hehe. Awesome giveaway Aurifil! Thanks for a chance to win. I have a few ideas for Christmas projects, but I have not started any. I don't know why, but I am very attracted to Halloween projects. I don't even have kids any more! Nope - no holiday projects planned yet. Thanks for being part of Jacqueline's group. Oh, my! No I haven't even thought about it yet. Still trying to get a few graduation gifts done. The Tropical Collection makes me think of the beach! I haven't finished last years holiday projects yet.....lol!! So No I haven't started my holiday projects for this year yet... and I am feeling the pressure. Thinking about Christmas projects..lol..nope haven't started any yet.. I haven't started any holiday projects yet, but still feel like I have lots of time!! Hand surgery and rehab have me sidelined from stitching at the moment... but I am busy planning holiday projects. Didn't Christmas just end? I haven't made one thing yet for the holidays. Maybe this quilt will be a gift. Have about 9 of my Christmas presents done and still have 12 to go, plus a 1st Anniversary quilt that just needs binding. Also have to start on 35 machine embroidered tree ornaments. Hopefully will be done by the end of June. Oh gosh, I can't even begin to think about holiday gifts yet I won't start those until at least September. I am working on starting my summer projects. I can't think about holiday projects. I haven't started yet. Still trying to gather ideas. Your embroidery is beautiful! I haven't started any holiday projects yet. But I'm having fun sewing some summer birthday gifts. Oh my goodness no! I haven't even began to think about sewing for Christmas! But I guess I really should start! It will be here before we can get a few spools sewn!! I would love for you to visit my blog! I'm still in the planning stages for Christmas. I have the fabric, now I just need to figure out what pattern I want to use. I'm making two quilts as gifts and many part holders as smaller gifts. Love your colors first off. Second I work on Holiday all year long, Multiple projects at once so I can give them to family and friends. Currently working on 6 BOM's that will be finished in November in time to ship for Christmas, plus just picked up some more Christmas fabric for a few table runners for those that aren't getting quilts this year. I usually send a box of ornaments to be distributed amongst family, as well as the quilts to specific individuals. Everyone is on the list that never seems to get shorter. LOL! Do love sharing my learned talents. I haven't even begun to think about holiday sewing...and that tells me I'm already way behind...lol! Oh Kim, I have plenty of stuff I didn't get finished from last year, so I'll use those as a "jumping off" point for this years' gifting! BTW, I use a fusible "no show poly mesh" ironed to the back of my fashion fabric, then when cool hoop it along with another medium tear away. Reduces the pucker factor greatly! Oh man! Can't think about that yet. 1st grand baby on the way. Am in "baby" mode for the foreseeable future :D.
Awesome block! Love the embroidery. I have looked for and made notes on what I plan to make for holidays..does that count as 'starting them'. I love your block! Hahaha, you're funny. :P I have not started any holiday projects yet, I made a list in February of all my WIPs and am trying to work through those. There are at least 30 projects on that list... and I've been fighting the need to start a new project of a lone star made with Christmas jelly roll strips! I like your colors, and thank you for the tutorial on the embroidery. I have a Bernina 150QE and I don't know what it would do if I tried heavier thread. It likes the Aurifil 50wt just fine, but it took me a while to figure out which thread it would work with. I am just getting into following various BOM's and mystery quilts now that a lot of my school volunteer work has wrapped up. I think I am going to be selfish this year and only work on things for me. Planning on making sports quilts for three of my grandsons. Got the ideas all planned out and fabric bought for one. Need to get busy as the holidays will be here before I know it! Like how you did thread painting for your embroidery. I love your block - how cute with the freemotion work! And I'm happy and honored to be sewing this quilt with you! Oh my goodness, I haven't even thought about holiday sewing yet - besides seeing all the new Christmas lines from Quilt Market on IG. I haven't started my Christmas crafts. I have some ideas. You are way ahead of me. Great work, I'm impressed. I downloaded the pattern last night plan to embroider my blocks but think it will be hand done as my machine embroidery skills are not good!Liking what you have done thought a hoop was needed to do the embroidery but see with a good stabliser it works without very well so maybe I will have a little practise. More hours in the day please. I still working on a 4th of July project. Haven't even thought about Holiday projects yet. I have not started yet but I am also one of those PROCRASTINATORS! I wait until the last minute but last year that was in November for Christmas projects. I am going to shoot for October this year as I am expecting my 3rd grandchild in mid December. I have started on what baby quilt I want to make, though! I have cross stitched some small Xmas ornaments but not made them up as yet. I am pregnant and due on 6 December so may be a bit preoccupied this Xmas !!! Oh boy... no I have not even thought of making holiday projects yet! I've got a Christmas wall hanging underway that I must finish.... have been thinking that for the last 4 or 5 Christmas's and it hasn't got any near finished! I love aurifil so Id really like to win. Thank you for this giveaway. I love your block and yay to you for the embroidery. It looks wonderful! As for holiday projects: no, I am not yet planning, nor working on them. But I have goals nonetheless! I have a quilt to bind and several garments to finish. At this moment I am most focussed on finishing WIPs. Finishing WIPs may also open up my planning for future (holiday!) projects. No I haven't started any Christmas projects yet I live in NZ and I still need to put the garden to bed for the winter and finish the last of my outdoor projects first. I have just joined a Monday night quilting group and they have a monthly challenge of making a Christmas decoration. I have just made my first one being a heart with a snowman angel on it. 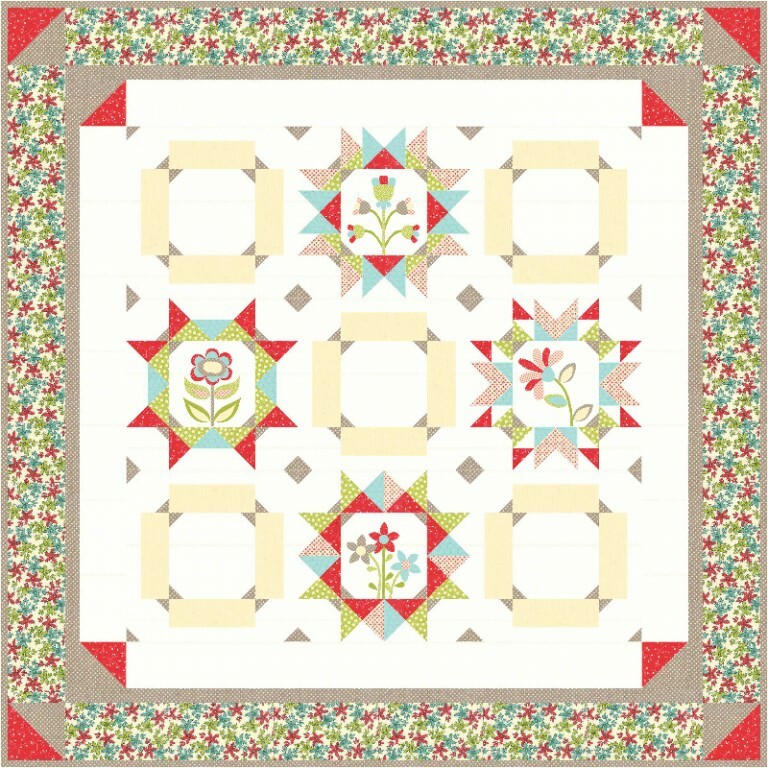 I am looking for a Christmas quilt pattern for a special family quilt to put up each Christmas but haven't found the right one yet. Your free motion embroidery is beautiful! So many projects, so little time! I love how you did your block in thread!!!! As far as holiday projects go, I make things all through the year, with intentions of using them for gifts that year. I am way behind this year, b/c I welcomed a new grand-baby. I really need to get on the ball & catch up! Oh, my! Does writing on a list that I have seven Christmas stockings to make qualify as starting? I do have the fabric all picked out, and the pattern. I was going to make five stockings last year for my grandchildren. But this year the number is up to seven.....twins due in a few months. I better get started! I haven't even thought about the Holidays yet. Probably start that in August. :) Thanks for the opportunity to win the thread package. love your work and love Aurifil thread. Seriously, I am working on projects from years ago. I am working on a Christmas tree skirt. Love your free motion embroidery think I would like to try that. Yes, I've started my holiday sewing and have completed one tote bag! Thank you for sharing the pics of your machine embroidery. I'm making this quilt and I appreciate your tips! Yes I have started my Christmas present quilting, I have pillowcases made and 2/3 of a quilt is quilted. I think the block that you made is beautiful. Your fabric choices are such a fabulous strong and vibrant choice especially when you chose to add the special free motion embroidery design in the center of the block. You did a wonderful job with this and it really does add so much strength and individualism beauty to this block. It is unique and special. I haven't even thought about holiday projects. I am new at this so I think that when this block of the month quilt is done it will be one of my holiday gifts. I haven't even thought about Christmas!! It is finally nice enough here in MN to be outside, so, I'm working on my outdoor gardens, etc. It will be football season before I start thinking about Christmas projects. They are only started in my head. I haven't started my holiday projects yet. I'm still trying to get everything unpacked and put away from our recent move! I love how you make your block! No, I haven't started any holiday projects yet. Thanks! I haven't started the holiday stuff yet. I need to get some UFOs done, and finish setting up my studio. Great block! I haven't started, but I am strongly encouraging myself to not wait until October but to start now. Fingers crossed. I didn't start thinking about it until I heard about a Christmas blog hop that will start in July! Love your free motion embroidery, have been wanting to start a 4th of July project, but time is getting away from me as usual, I love christmas fabric and have been buying some each time I go to my local quilt shop, don't know if I'll have anything made by christmas if I don't get busy. Love your embroidery work.No I haven´t thought about Christmas projects,after summer. I haven't started any Christmas sewing yet, but I have some ideas and will probably start in August. Love your block! Thank you for the chance to win. Oh my goodness no way have I started on Christmas sewing! I'm still working on outfits for my grandchildren (4 of them anyway) to wear at our annual 4th of July parade. We live in a small Iowa town that goes way out for the 4th. I love your block! I've done some of that while quilting w/my longarm. Nice idea. I never thought about free motion embroidery and just might have to try it when I finish the project I'm working on now. Your block came out wonderful. Haven't started any Christmas gifts yet and not sure that I'm going to this year. Thanks for a chance to win. Your free motion embroidery is great! I haven't even started the quilt block - let alone holiday gifts! Although, I have started EPP quilts for both my daughters! Wow! I am very impressed with your free motion embroidery it turned out beautiful. I have a Christmas quilt that I am working on but haven't finished yet. I am still sewing the blocks together. Ack, I haven't even thought about holiday stuff yet! LOL, no! Perhaps it's time to though?! Yes I have started on my Christmas projects, in my head! LOL.... I guess I should get started. I havent even thought of christmas yet. Our local shop has a christmas injuly sale. I may be thinking of christmas then. Ah no, I have not started any projects yet, not even any planning! I have 4 quilts in the works right now (this one is the 4th lol) all of them mystery quilts I really need to get started on Christmas. I do have gifts in mind tho just have to get a move on them. I can't believe this but yes, I've finished a Christmas quilt already. LOL! We are in wintertime mode down here in New Zealand, cold mornings, frosty grass, and Christmas seems a long way away. My friend Joyce is embroidering squares, the latest is a frog, the others are an umbrella with flowers under, a smaller frog, a line up of ducks, and these will have borders added and each one will be an outside pocket on a bag. Perfect for gifts, and so useful too. This is a fantastic give-away, and international entry is very special. I have not started my projects yet but have started planning for them. It would be a good idea to get moving on them though, thanks for the inspiration. I have started Christmas sewing. I have 2 quilts in the works. One is a BOM expected to finish in the fall. The other was a quick sew along like this one and even though it just finished, I'm not done...but I'm getting there! I've not started anything for the holidays. It's too far out for me still. I thinking about making oven mitts and table toppers for gifts this year when I do start them.